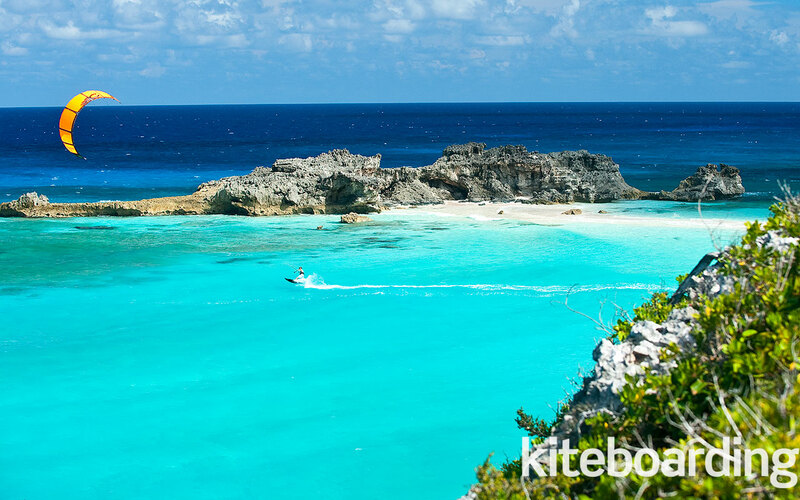 A diary of my beginnings to Kiteboarding. Jan juc, originally uploaded by Trackingtom. 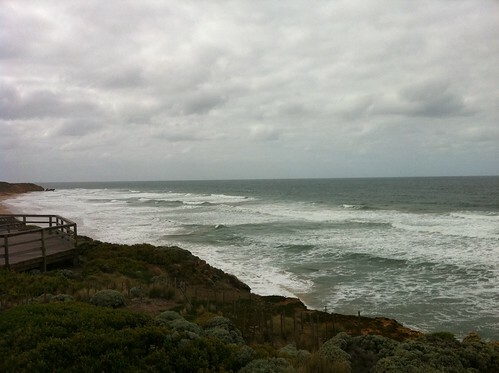 Today I ventured out with of Port Phillip bay into Jan Juc. The purpose of the trip was to learn how to surf a wave long board style. My boss has long been on my back about learning how to long board and for the past 6 months we had been putting it off. This weekend we had his beach house empty, the weather and swell conditions looked optimum and everything looked positive for a good session into the a first venture on a long board. Long boarding is hard, and you have to continually work to stay in the correct spot. By the 15 minute mark I could feel muscles in my shoulders that I probably haven't used before. We arrived at the water at 8.30 (quite an early start for the day leaving from Caulfield) waxed the boards ready for use and suited up. My instructor (boss) didn't really give me any start up tips but said "you know what your doing, just watch the other people. Line your body up with the centre of the board and you'll be right!"...... Right. So I lined myself up and hit the water. Man these boards are huge (duh! that's why they call them long boards!) and maneuvering them is like doing a 7 point turn in a small street. You know its going to turn around, but it just takes its time. I paddled, paddled and paddled some more. You paddle out to get in a good position, then you continually paddle to stay in that position and when there does look like a wave that you can catch you paddle some more. So much work for a 15 second ride. Are we spoilt as kiter's? Much to say that I didn't catch many waves or did I manage to stand. I could get on the wave, get to my knees then attempt to get to my feet and I would get half way and top over. My problem I was told was the 2nd part to my process, going on my knees, I should try and go strait to feet. After two hours of paddling my body couldn't paddle any more and I sat on the sidelines and watched. Highlighting my need to improve my fittness. 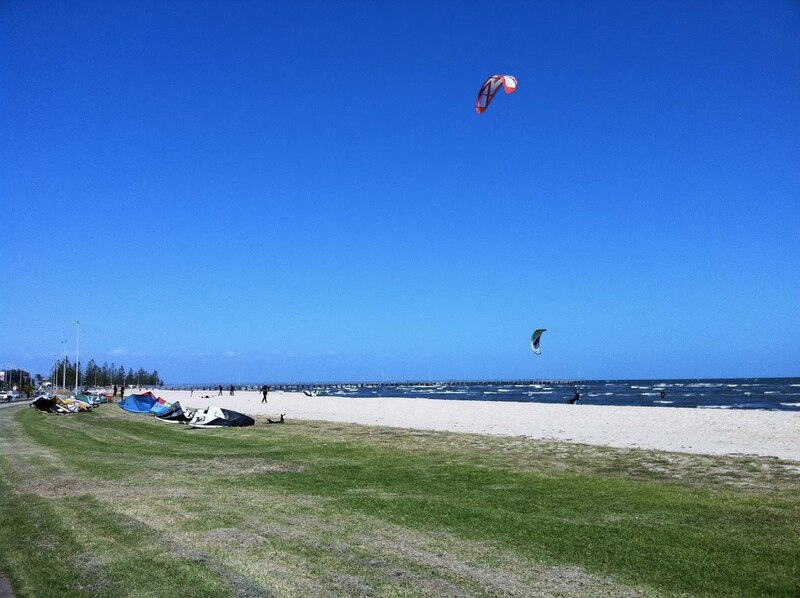 The wind picked up in a southerly direction and I started to get excited to get on the kite. We had a few hours rest then went to point danger to set up and ride. Clint again came out for a surf and jokingly at the start with the wind blowing westerly I said that if we get into trouble its going to be hard as it'll take a while to get back to shore and the most westerly point from here was kilometers out! "Proper body position is the key ingredient for good power control and resistance against the kite. I like to tell my students to think about playing tug of war when edging. The winning team doesn’t bend over! It’s all about keeping your hips forward, your shoulders back, and your head looking in the direction you want to go. Proper weight distribution over the board can be achieved by keeping your front leg straight and your back leg slightly bent." My hips weren't forward, shoulders not back and my head was on a 45 degree with my direction (if 12 o'clock was strait ahead, my head was pointed at 10). I was on the board literally for 10 minutes, cruising along not in complete control as I believe I was a bit overpowered and hit some big swell. I came off and the kite dragged me downwind for 10 meters or so. Without my board. No worries I'll just kite upwind and grab it. Right? I was struggling on the water and lost sight of the board. The wind was too much for me and with the added hinderance of the increasing swell I was the mayor of Struggle Town. I probably fought it out for 20 minutes or so and I was dragged too far downwind to 1. See my board and 2. Get close enough to gab it. So I sailed to the shore and took my chances with the board. Now I was ages out from shore and when I set foot on the sand realised just how far out I was and increasingly how far out the board currenly is. I got a hand to land the kite and jumped into the water in vain swimming after my board. Needless to say after 20 minutes swimming and probably 500 meters from the shore I was not going to go home with my board. I'm lucky the fish can't understand english too well as my language was probably not appropriate for the sunday schools of fish that were swimming underneath me. I packed my kite up and caught up with Clint. He said he'd go out and have a look for it but he is still learning on the board so most of his concerntration was on keeping upright and flying the kite. I appreciated the fact that he went out there but my mind was already thinking about what I was going to do now that I had lost my board. Seabreeze lost and found forums, a notice on the Jan Juc noticeboard, ect. Then to buying a new one or 2nd hand one. I wasn't in a good place safe to say. Clint had no luck, I had packed up and by the time I was at my car packing the kite and wet-suit away he arrived with his kite and gear also packed. He suggested that we get his binoculars and have a scan of the beach but my brocken spirit and pesemistic attitude at the time was settled with the loss and just wanted a hot shower and a few cold beers. So we said our goodbye's and the boss and I headed home with some beers and mexican food in the boot for dinner. Just as we arrived home my phone rang. It was Clint. "He mate what's up? "I sad unsure of the call, part thinking he might have found it but more so that this was regarding something completely off topic. "What, you found my board" I said with a fake laugh. "That's it buddy, I have it in my hand! I went down the beach in the car, had a quick scan for half an hour or so and just as I was about to give up this couple I initially notice walk past me when I got there were now walking back to the carpark with your board. So I ran overthere like a excited 4 year old finding his lost bike, told them the story and that it belonged to a friend and they happily gave it over". I was in shock. I had totally given up on the board, my body was spent and that too my mind, yet I had my board back to the great gesture from Clint to stay out long after I had given up to retrieve my lost board. Now that I have it back and have gone through this I am seriously looking at getting a leash. I have read that many people believe that it can be dangerous to have a leash as it one does fall and get dragged downwind the board is going to follow in the same speed you were dragged and its direction is going to be at your person. But the odd bruise or cork from the board I'm thinking is better than forking out for a new one when one overconfidently goes too far out and looses it. I guess its easy to become accustomed to one's home spot. 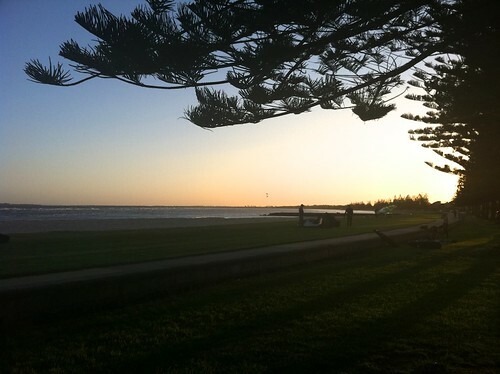 Altona is shallow and when I usually loose the board I walk back to retrieve it. Until today I haven't really thought about it. What are your thoughts. Have you or do you use a board leash and what have been your experiances with it? No more long walks on the beach. I no longer have to walk my kite back up to a starting point and surf downwind. After an exhausting 3 hour session today I have found the ability to go both directions with little effort to get me started. Before I needed to be quite a way up wind, set the kite in motion, sail a fair way downwind and then try my way to get upwind. Today I no longer need to do this, well to some degree that is. Its a pretty great feeling for the ability to sail both directions without the need to walk up and down the beach, not to mention more fun! This was my great envy of other kiters. It looked so easy to be able to surf bidirectional and to be able to go 'kite exploring'. All I was managing to do in my first 5 sessions out of kite school was a few 'superman's', stalls in the water and the odd attempt that might look like I knew what I was doing. The thing that shocked me most of all this was when I was sailing either direction, just how fast I got to the other end of the beach. I'm aware it is much faster than walking; but I went up back, up and back in 20 minutes which two to three sessions ago would have taken me an hour. Once things start to 'click' one's progression in this sport is quite rapid. I cannot fathom being able to jump or launch off small waves yet but ask me 3-5 sessions ago if I thought I would be sailing bidirectional and not needing much room to launch I would have thought that not to be possible. I guess jumping isn't a real goal at the moment more that some kite exploring. I have noticed that further south of the Altona spot that I have been surfing that there has been some kites way out into the distance. I initially thought this was another spot and went home to investigate on google maps. It turns out that that area is inaccessible by car and the only way to get out there is by water. So the kites I have noticed out there probably started from where I launch. Peter's kiteblog demonstrates this here, also see below for image. Now one part of me thinks that in another couple of session's I'll have no worries being able to get over there; but the other side of me, the one with the issue is, that do I possess the skill if something goes wrong while over there to fix the problem and get me back to the safe beach? It's a long walk back to the beach and further more I would be doing it barefoot. These feet of mine don't like being bare, I guess that is from years of being a shoe lover and never hardening them up. Kinda sad really. But no one ever gets anywhere from being safe, and this sport in general isn't a dangerous one but neither does one describe it to be 'safe'. Maybe not the next session, but definitely within the next few. I have added my a wallpaper I found from a US kiteboarding magazine I've started to subscribe to on the iPad for something like $20 per year. With the AUD doing so well at the moment it's too hard to resist. You can find the website here. I've also added them to my blog page. Plus I'm having issues saving the seabreeze images that indicate the wind for my sessions. Altona Labor Day, originally uploaded by Trackingtom. It has been a while since my last session. My only reason for such is I have been hitting the books trying to get over my last license test to become an electrician. I've done two of the three tests and only have the practical test left, meaning I don't need to spend as much time studying, leaving me some time to get back on the water. 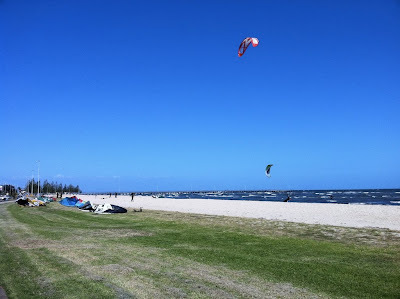 I arrived in Altona at 5pm, the wind was consistent and there were plenty of 12Meter kites on the water, which all were good signs for good session. Pumped the kite up, received a hand to launch it and headed out into the water. The tide was further out than usual, might need to remember this when crossing the shallower sections. To start with I directed the nose of the board to my preferred side, left, and got strait up. No worries at all from the outset. Headed all the way up the left hand side of the water and was having a blast. There were no clouds in sight, the temperature was ideal, the water was a little choppy but all in all a great afternoon for Kiteboarding. Altona wasn't too busy, there were a few boarders out there and it seems to be a place where a lot of beginners/intermediate boarders surf. With 20 people on the water there is 10 or so that can ride, 5 that can get up on the board and surf but don't look as comfortable as the first 10 (intermediates, me) and the other 5 or so are pure beginners. Everyone seems to be friendly and cautious of each other. Today was the first time Clint came out for a surf. He and I did the initial training with GoKite and since our finish in December hasn't been able to get out on the water with his new gear. Clint got there earlier than I and was having similar issues to mine at the first session. Dealing with the small waves, remembering how to stand (or not to stand) on the board, and controlling the kite while being conscious the first two. That I think is one of the harder things to kite boarding to master. Keeping the kite in a position where you are being pulled at a controllable speed and also the ability to go upwind. This is what messes with me at times. I have the kite in a too powerful position and I am unwillingly heading downwind at a fastened/uncontrollable pace, or I don't have enough power in the kite with the added direction of the board pointing upwind I'm finding myself stall. In so much of your training you spend your time looking at the kite and making sure your in the 'power zone' that when you are on the water with your own kite and heading along the water you still find yourself wanting to look at the kite but also realize that if you don't look ahead you could crash into someone else. Knowing where your kite is and the power its generating is the skill you need to master. Because I believe that if you can control your kite without looking at it and 'feeling' the force its giving you, all things will improve from this. Board control, stance, speed, negotiating waves and other boarders. The big step forward for me today was my placement of my feet on the board. I had not paid much attention to this until I stumbled upon it today. The last session I had gave me cramps in my left foot for a week. My instructor kept telling me to ride with my heels. So I would place the front foot out, 80% of my weight on the back and pull my toes skyward. This is what was giving me the cramps, the strain of pulling my toes up continually. But for what I stumbled upon today was placing my feet on more of an angle in the feet holders to get the desired 'heel position' I knew I needed. It was amazing the difference this made, it made a HUGE difference. I was feeling more comfortable in the water and I could lean back and head upwind. This all leading into the heading of today's blog.... Bidirectional! Utilizing this new stance gave me the ability to head to the right. Now it wasn't as smooth as the preffered side but it sure beats the hell out of body dragging all the way up the right hand side of the beach to start again. My lauch is rusty, kite control rusty, stance ..... still getting used to, but I am surfing both ways now and feel the confidence that I will be able to do this sport well. My aim is to do some downwind riding. Hopefully Clint sticks with it and we can do a St Kilda to Williamstown crossing. Riding with a destination instead of up and down the beach. Don't get me wrong, I am loving this at the moment, but I can see it becoming tiring. Sunny 26 degrees kited from 12pm to 3pm. What a session. With my natural stance (right foot behind) my progression is going great. I can launch without a hassle anymore, i can head downwind and as of today I managed to surf upwind! I put the excamation mark there as this I didn't think was going to be possible for a while. Its hard to know how your riding when its just you on the water, of course there are other riders there but alone in the sense of no kite buddy. So without someone saying "Your riding too upright, or put your front foot out more" its hard to know how you riding or even if your riding properly. Kite control, or more kite position is easier as its in front of you but my feet have still been the main issue. So after watching a few people fly past me and seeing that they are almost "sitting" on the water I realized that my stance is no where near this. I still try to stand on the board rather than lean back on the kite and let it do all the work. So with watching this I water launched started to head downwind and gain some speed; then I leaned back, pushed my back foot out and started to ride upwind. Man its a good to be able to cruise and not fall off. That's what I have been wanting to do with this sport since I started my lessons. There is one issue though, I can't get back on the other foot. For what ever reasons it is, and i presume its still my foot work, I can't go back on my left foot (goofy stance). I get up from a launch and fall. Or I over power and 'superman' through the air. So this is where my attention needs to be focused over the next few sessions. Plus it will give my left foot a chance to rest up using it pull the board, edge, so I was riding more on my heels has given me this aweful strain. No pain no gain hey? My lesson buddy is going to come out with me today, Monday 10th, he bought a harness and is going to have a crack at riding without the instructors in Altona. Altona is DEFINETLY better to set up and pack down. The sand and crap from my last session at St Kilda has put me off it. As you can see by the pic below to the right of the path is a grass area protected from the Southerly wind to set up and pack down in. The guy with the yellow kite did exactly this. Its just a much better feeling having the kite clean and dry. Hopefully both feet are feeling better by days end for another session. Sunny 26 degrees kited from 3pm to 5pm. Today wasn't the best day to hit the water. I figured with what North said about their kites that heading out into the water blowing 12 knots, that I would be fine to put the 12 in the air and have a session. The water was flat, there weren't many people out there and there wasn't a cloud in sight. Perfect right? The wind was nowhere near enough to get me going. I could water launch, get up and then there wasn't enough wind to turn the kite back up to 11 after and keep me going. So I would launch and sink, launch and sink, then launch and sink some more. I tried this for about 45 minutes then without going anywhere decided to call it quits. There were some other kiters out there but by the looks of it they were on 14's, 16's and I believe I saw an old school 18 out there too! So knowing either my kite was too small or that I wasn't skilled enough I headed back to the beach, but as I decided this my kite lost all power and hit the water. No worries I’ll just water launch. But as much as I tried and tried I couldn't. There was enough wind to pull it towards the window but nowhere near enough to lift it off the water. I tried in vain for over half an hour with no luck, and seeing as I needed to be at my partners work in 45 minutes for us to inspect a new house to rent; I was running out of time. The only thing I could do was to pull the 5th line in and pull the kite in. I did this, the kite was wet, the lines a little tangled and there was no chance that I would be able to dry the kite off before I packed it up. Lesson learned: If you’re keen for a session, pump up the kite, get things ready, but wait for the wind to be right instead of assuming it’ll be right when you need it on the water. See if there are other kites your size on the water and see how hard they are working the kite to get momentum. Labels: north gonzalez 2010, north rebel 2009, st kilda. Foot isn't broken or fractured. The doc has had a close look at the X-rays and there isn't a break. I still have to stay off it for a week or so but at least it's not 4-6 weeks in a boot/cast. 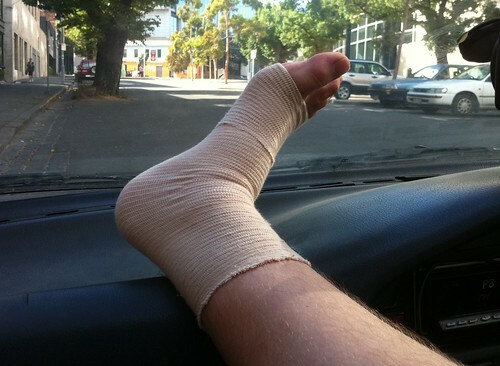 Fractured foot., originally uploaded by Trackingtom. The foot feels 100% than it did yesterday. I probably should have followed the RICE actions towards it day one. I did all this last night and feel the difference today. I had nightmares that it was fractured and would have to be sidelined for the next 4-6 weeks. Missing most of the summer sea-breeze's!